You do conduct post-mortem for your projects (both personal and professional), don’t you? I’ve long since conducted post-mortems for professional projects, but have only recently started the practice for personal projects. We always think we’ll remember…everything…but the details fade so fast. And really, with as much technology as we have available to capture information, why rely on our brains? Free up that brain space for productive thinking, not remembering details of past events! We’re moving next month, and as we’re gearing up for that, I went back and reviewed my recap notes from our last move (only 10 months ago!). What do you know…there were a number of details I had forgotten…how long it took to load the truck, how many people we had helping (and how long each of them was there), where we had downtime in the process, and more. Is this the part where I dare admit that I’d actually forgotten I’d done a post-mortem of our last move and found it by accident? Because I had done a post-mortem of the move, I can now use that as a base to plan our upcoming move and save a whole lot of steps in the process. Yay! 2. Write down everything, even things that seem so obvious at the time. 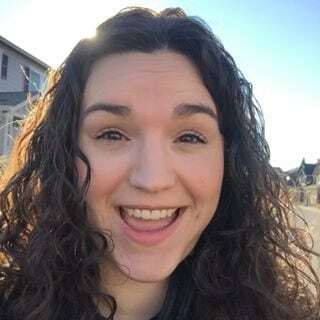 Don’t rely on your brain – every single project recap I do, there’s at least one piece of information where I say “Oh, this is ridiculous, I won’t possibly forget this,” (Yes, I talk to myself a lot.) Inevitably, at least one of these obvious pieces of information is forgotten by the time the next project rolls around. I know, this seems to be opposite advice to the last point, but really, don’t overcomplicate it. A post-mortem doesn’t have to be formal, and it doesn’t have to be lengthy to be effective. The post-mortem can be as simple or as detailed as needed for any particular project. It happens to the best of us that we have full intentions of doing a post-mortem right after the end of a project, and somehow it’s suddenly well past the event. Don’t despair! You can retroactively do a post-mortem. It won’t be quite as good as the real deal, but it’ll certainly jump start your planning process. If you haven’t done an official post-mortem, and you’re planning a project similar to one you’ve done previously, don’t despair. Review old documents. For our last move, I have a moving folder that has the receipts from the rental truck, utility changes and papers from our property management company. Review old emails (and text messages). If you vaguely remember when the project was, you can often recreate what went well and what didn’t by reviewing emails, text messages and social media posts. The only way my children will have baby books is if I recreate information based on Facebook posts and text messages. I haven’t yet decided if that’s a #momfail or #efficient. Bonus Tip: As you’re planning any project, get out there and schedule your post-mortem as soon as possible after the project is scheduled to end! Get the template: I’ve created a Post-Mortem template in Evernote. If you’re on my ever-fantastic email list, you’ve already got it (along with the rest of the Evernote templates!). If you’re not, what are you waiting for? 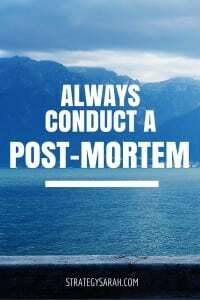 Do you use post-mortems? When have you found them most effective? Is your marketing communication and the content you share effective? If you’re not seeing the signups, sales or conversions you expect, one easy place to start troubleshooting is a key area of communication: your contact info. I recently received a postcard to sign up for more information about a project, business, opportunity. It was exciting, and definitely one I wanted to sign up to get more information. So I looked for the website to check out more information and sign up. There wasn’t one. There also wasn’t an email signup sheet, Facebook page, Instagram or Pinterest account, or any other way to connect online, through apps or through social media. Edited to add: There wasn’t even a phone number. In a face-palm moment, the fact that a phone number was a missing typical piece of contact info didn’t even occur to me. Oops. Clearly there are ways that I don’t think to communicate! My husband and I laugh whenever my mother-in-law pulls out a phone book to call a local restaurant or business. My parents recently sold their house (to move near us, yay! ), and my mom made sure to leave all the phone books neat and tidy. I didn’t have the heart to tell her the new owners are unlikely to use them for anything other than a paperweight. Maybe I’m wrong. Maybe they’re phone book junkies. I know that it would never occur to me to use a phone book, and it’s probably been close to 20 years since I’ve had one in my house (pretty much…since I moved out of that same house my parents just sold!). The only way to sign up was by scanning a QR code. This may be shocking, but not everyone uses QR code readers. And if your customers, audience or anyone you’re trying to connect with can’t connect with you, you have a major problem. If I wasn’t highly invested in the subject, I would have quickly abandoned a great project. It’s easy to fall into a trap of thinking that everyone is just like us, and uses the same ways to communicate. With billions of people in the world, and over 325 million in the United States alone, it’s unrealistic to expect everyone to communicate the same way. If people – aka consumers – aka your target audience – aka those individuals who want to give you money – don’t know how or where to find you, they can’t buy from you. You need to offer multiple options for people to connect with you. The average person is exposed to hundreds of ads per day. If they are interested in what you have to offer, don’t make it harder than it needs to be to get connected to you! One more not to use a sole means of communication: I’ve also seen this with Facebook event invites. Yes, they’re easy, but there are many people that aren’t on Facebook for a variety of reasons. Are they being excluded simply by nature of how an invite is sent out? Are you inadvertently hindering your friends, customers, fans or audience from joining what you’re doing because you have limited options to connect? 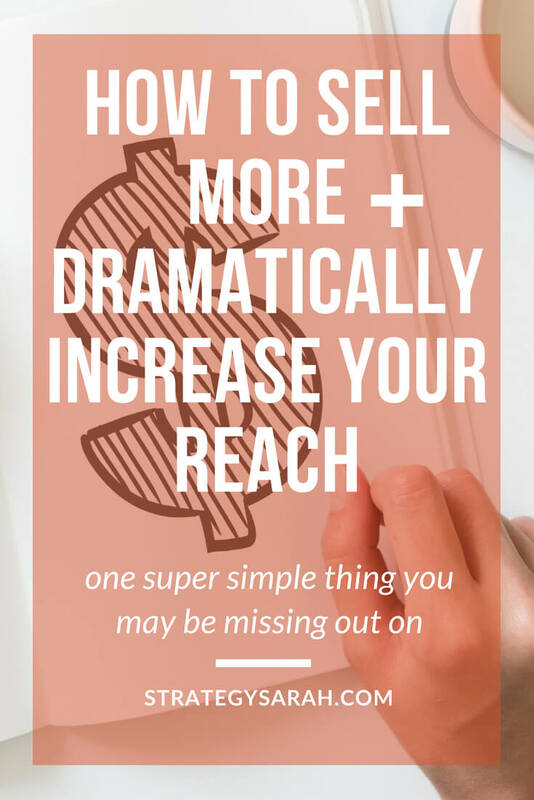 To maximize connection (and increase sales) make sure people know how to contact you! If you don’t have a website in 2018, do you even have a business? Setting up a basic website (like this one!) is super simple using WordPress and Siteground hosting (aka, what I use). Better yet, a way for people to sign up for an email newsletter for you to stay connected with them right in their inbox. I use and recommend ConvertKit. Yes, this is still important, especially if you’re a local business. I have the same phone number I’ve had since 2001, which is super weird to think that it’s been with me longer than just about anything else – my last name, my husband, my kids, my house. These are self-explanatory at this stage, right? Instagram, Facebook, Pinterest, Snapchat, any other fancy new social media platforms that I don’t keep up with. Whatever you do, offer multiple ways to connect with people and for them to contact you. You may not offer all the contact info types – you won’t find a phone number anywhere on this site – but think about what types of communication platforms the people YOU want to connect with are on. If your audience is teens and twentysomethings, that’s going to likely look vastly different than targeting those in their 50s and 60s.